A talented top four from last year's 3200 meters in AAA has graduated, and a solid AA top two is gone as well, leaving for door open for a new crop of 2 milers in PA that will look to rise to the top of the state. 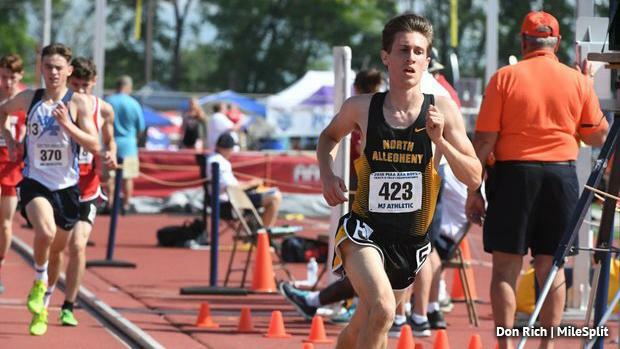 The state's top returner is Daniel McGoey of North Allegheny. As a sophomore, McGoey ran 9:24 at Baldwin, and later went on to take fifth at the state meet in AAA. McGoey will be a serious threat for the state's top spot, along with his teammate at NA, Zach Kinne. Kinne transferred to NA from Illinois in the summer and has since made a huge impact on the state, taking second at XC states in AAA (McGoey was third) and most recently running away with the 3K state title indoors (McGoey was second). Look for this duo to make some more noise. Other returning AAA medalists in the 3200 include General McLane's Nate Price (sixth) and Unionville's Cole Walker (eighth). Mars Area's Zachary Leachman, Manheim Township's Ian Miller, and Fox Chapel Area's Christian Fitch are among the indoor 3K sate medalists that will look to get on the podium in outdoors. Mifflin County's Brayden Harris and Downingtown West's Payton Sewall also dropped sub-9 3Ks indoors this winter. Ephrata's Andrew Foster went 9:28 and Conestoga Valley's Nathan Grucelski went 9:30 for 3200 last spring and both should be factors in the event again this spring. In AA, a host of strong runners are back that should make it interesting. North East's Josh Lewis has the fastest returning time -- a 9:26 from Baldwin last year. He was fourth at states last year, behind the top state meet returner Andrew Healey of Holy Cross. Healey was seventh in the 3K at indoor states. 1A XC state champ Jack Miller of Jenkintown (sixth at outdoor states last year) may be the one to beat, though. After his triumph in the fall, Miller took fourth in the 3K at indoor states. Penns Valley's Colton Sands (fifth) and Lancaster Mennonite's Logan Horst (seventh) are also returning AA medalists from states last year. Wyomissing's Ben Kuhn was ninth at states last year, but is coming off a good winter that saw him take fifth in the 3K at states.